Shazia Sadiq is currently working in the School of Information Technology and Electrical Engineering at The University of Queensland, Brisbane, Australia. She is part of the Data and Knowledge Engineering (DKE) research group and is involved in teaching and research in databases and information systems. Shazia holds a PhD from The University of Queensland in Information Systems and a Masters degree in Computer Science from the Asian Institute of Technology, Bangkok, Thailand. Her main research interests are innovative solutions for Business Information Systems that span several areas including business process management, governance, risk and compliance, and information quality and use. She has published over 100 peer-reviewed publications in high ranking journals such Information Systems Journal, VLDBJ, TKDE, as well as major conferences such as SIGMOD, ICDE, ER, BPM, ICIS and CAiSE. 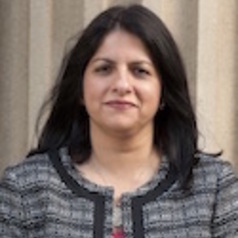 Shazia is currently Deputy chair of the National Committee on Information and Communication Sciences at the Australian Academy of Science, and a University of Queensland Teaching Excellence Award Winner.